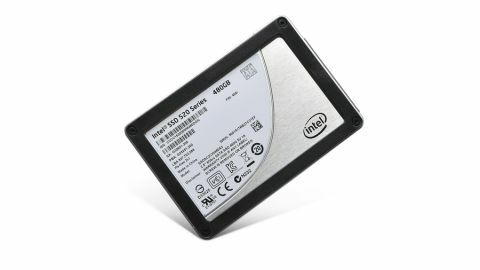 Conventional magnetic hard disks are certainly available in larger capacities and £80/$120 will buy you a 2TB drive, which makes a mockery of the Intel 520 Series SSD 480GB's £620/$780-odd selling price. What you don't get with a 2TB magnetic lump, of course, is SSD performance, physical robustness or low power consumption. Moreover, a 480GB SSD is likely to be a big enough boot drive for the vast majority of PCs. It should even get the job done for gamers with a big Steam collection, after all, just a few years ago a 500GB HDD would have been all we had in our gaming machines. The general rule of thumb for large SSDs is bigger equals better. But the new Intel 520 Series SSD 480GB proves there's a limit to that. In fairness, this large SandForce-powered drive isn't alone in seeing write performance fall off compared to smaller siblings. Drives around the 500GB mark based on Marvell's controller, like the Crucial M4, suffer the same problem.